Ismail Boxwala, an ultimately good man haunted by a horrible mistake, provides the focal point of Doctor's moving second novel in which she examines with crystalline clarity the plight of this gentle, middle-aged Indian immigrant living in Toronto. Twenty years ago, Boxwala accidentally left his baby locked in his car, resulting in her death. The tragedy destroys his marriage and induces a long struggle with drink; still, Ismail keeps his job and home and eventually finds himself drawn to Celia Sousa, a 50-year-old Portuguese widow, left penniless by her gambling-addict husband, and currently living with her daughter on Ismail's street. Doctor (Stealing Nazreen) charts the growing heat between Ismail and Celia and weaves in a sweet secondary story about Ismail's fatherly friendship with Fatima Kahn, a bisexual Indian college student. Doctor also folds the past into the present throughout, allowing the dead to haunt the living and providing both a realistic portrayal of suffering and a paean to second chances. Shauna Singh Baldwin, author of What the Body Remembers, The Tiger Claw and We Are Not in Pakistan: “I laughed and cried as I read Six Metres of Pavement and followed Ismail and Celia — endearing, brave, and foolish characters who have to live with the irreparable and irreversible. 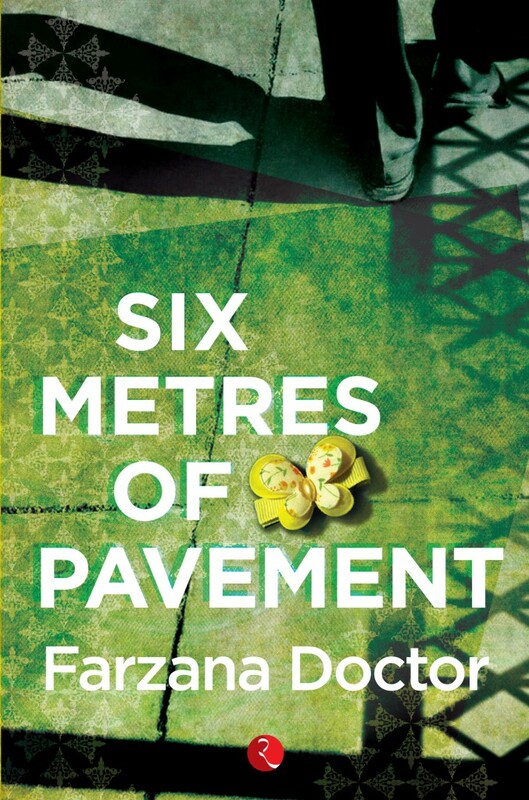 Farzana Doctor blends cross-cultural empathy with wisdom, and shows us paths to wholeness. Read this delightful, warm guide to remaking and choosing your family.” July, 2010. From Publisher’s Weekly: “Ismail Boxwala, an ultimately good man haunted by a horrible mistake, provides the focal point of Doctor’s moving second novel in which she examines with crystalline clarity the plight of this gentle, middle-aged Indian immigrant living in Toronto. Twenty years ago, Boxwala accidentally left his baby locked in his car, resulting in her death. The tragedy destroys his marriage and induces a long struggle with drink; still, Ismail keeps his job and home and eventually finds himself drawn to Celia Sousa, a 50-year-old Portuguese widow, left penniless by her gambling-addict husband, and currently living with her daughter on Ismail’s street. Doctor (Stealing Nasreen) charts the growing heat between Ismail and Celia and weaves in a sweet secondary story about Ismail’s fatherly friendship with Fatima Khan, a bisexual Indian college student. Doctor also folds the past into the present throughout, allowing the dead to haunt the living and providing both a realistic portrayal of suffering and a paean to second chances.” Jan. 2011. From NOW Magazine: “If you’re looking for believable characters, look no further than Farzana Doctor’s fiction. She has a gift for reality-based situations and conveys anxiety and passion in a story that turns into a real page-turner.” March 3, 2011. Read the rest here. From XTRA! : “Doctor expertly matches these diverse characters together in intimate situations, creating tense or touching moments of connection across divisions of age, gender and sexual or cultural bias…Doctor leads us to this understanding with wonderful sleight of hand. It sneaks up and then hits with a tender wallop. Novels don’t often spring sudden tears from me. This story did it several times, and never with tawdry tugs at the heartstrings. The book cuts deep, to the core of love, universal need and our responsibility to others.” March 24, 2011. Read the rest here. PUBLISHED by The Dundurn Group in North America and the UK, distributed in Canada by University of Toronto Press and in the United States by Ingram Publisher Services (1-866-400-5351 or email) and in Europe by Gazelle Book Services. Available through Rupa in India. TEACHERS AND ACADEMICS: Six Metres of Pavement would be appropriate as a course text for a number of disciplines, including Women's Studies, Social Work, Sociology, Religious Studies and English. If you are interested in using my books as course texts, contact the publishers for a review copy. I may be available to come speak to your class. You can FIND COPIES at local booksellers and libraries. Try the independent bookstores first! If they don't have a copy, have them order it in. Also available online through Amazon.